Soya flour is obtained from Soybeans. It is widely used in food industry for preparing bakery products, cereals, baby products and pet foods. A good quality soya flour improves the taste and texture of the product. Big industry leaders in soya flour take special care on the quality of the flour. for that, they require some high tech sieving machines to separate foreign particles such as inspects, lumps and other unwanted impurities. 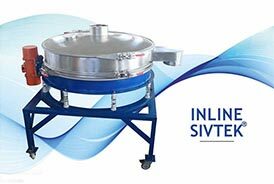 One of the leaders in the food industry was looking for a reliable vibro separator which not only removes foreign particles but lumps present in the flour. They were using a vibro sifter from a known supplier but capacity and quality was the issue. They landed on www.galaxysivtk.com and ask SIVTEK expert for a favor on the issue. On the same day our sales manager contacted the plant manager and scheduled a meeting at client site. After a detailed inspection of the process and material, our expert suggested a SIVTEK Vibro separator with the deblinding kit. Galaxy Sivtek sales manager concludes that if this machine is installed in the processing line it will produce a higher throughput capacity & will eliminate any impurities which are in larger size. We have also suggested a deblinding system which will help them to avoid chocking of the mesh. Galaxy Sivtek's aftermarket support team also suggest that these machines are used in long run, therefore it should be maintained properly. special training was given to maintain the durability & cleanliness of the machine. As soon the machine was installed in the processing line, it was working like a charm. They were getting high throughput like never before and when a Quality check specialist checked the product it was up to the mark of quality. Plant manager mentioned that dusting was the main issue before and we were losing valuable flour. Now we don't see the dusting issue anymore and there is no problem of any contamination. Triple your output without increase the size of your machines!